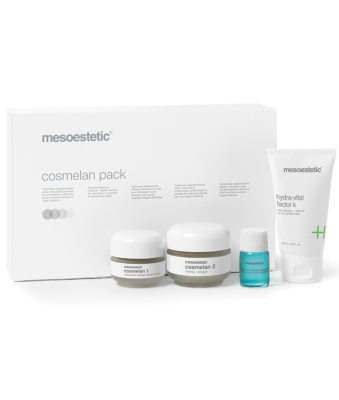 cosmelan from mesoestetic is a professional, topical brightening treatment that targets all types of brown patches and skin discolorations. It significantly reduces the blemishes caused by increased Melanin production by gently fading the pigment and suppressing further pigment from resurfacing. It contains embellishing agents which equalise skin tone giving it luminosity. 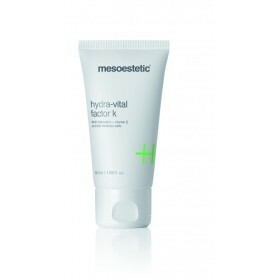 Description: Ultra moisturising cream particularly indicated to return smoothness and elasticity to dry skin. Its exclusive formulation manages to maintain the hydration of the horny layer and to restore the hydro-lipid layer. It ensures the protection of the skin against external aggressions, neutralising the free radicals responsible for premature ageing. Indications: It must be used after mesoelcat, cosmelan, mesopeel, dermamelan treatments or any other treatment involving temporary skin dehydration. Ideal as a daily care product for dry skin or as a moisturising complement for a specific treatment. Hydroviton: natural ultra-moisturising complex based on a mixture of amino acids, urea, allantoin, sodium lactate and mineral bio-salts. Amniotic fluid: biological moisturiser that easily diffuses through the skin. Silicone oil: it creates a protective film that prevents transdermal evaporation. Method of Use: Apply in the morning and night after cleansing and toning the neckline, neck and face with a gentle massage until complete absorption. In the morning, complete with the application of moisturising sun protection. As a post-treatment intensive moisturising step, apply up to three times a day. As maintenance for dry skin, it is advisable to apply it twice a day; three times a day in very dry climates. 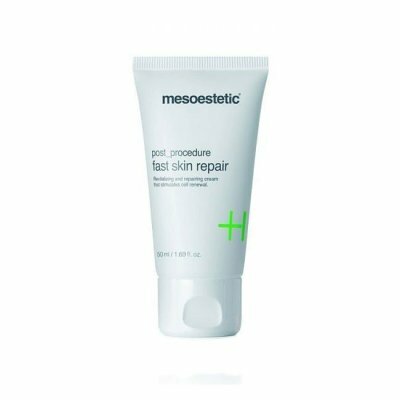 Post Procedure Fast Skin Repair is the latest generation in hydrating creams. It revitalises sensitive or compromised skin. Application immediately transforms the surface of the skin, reducing inflammation, and improving elasticity and firmness. Active ingredients diminish the appearance of fine lines and wrinkles so the texture of the skin appears smoother. is a product that offers high protection for normal and dry skin against ultraviolet rays, which are largely responsible for premature skin ageing and the appearance of hyperpigmentation. It contains vitamin E, high antioxidant power. Due to its highly moisturising active ingredients, the use of Moisturising Sun Protection SPF50 + is ideal for normal to dry skin. 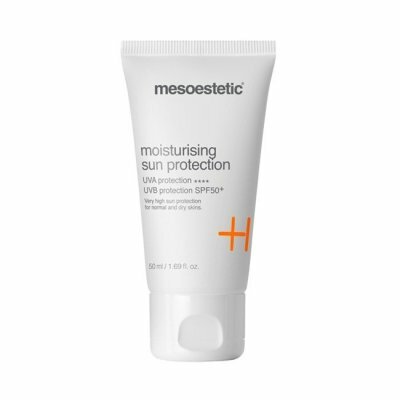 For oily skin, it is recommended the use of Dermatological Sun ProtectionSPF50 + also from Mesoestetic.